Gold Happy Necklace. 14k Gold Filled Script Wire Happy Necklace. Happy Necklace. Boho Chic Yoga Inspired Gold Handmade Necklace. Happy Necklace. Get your happy on! 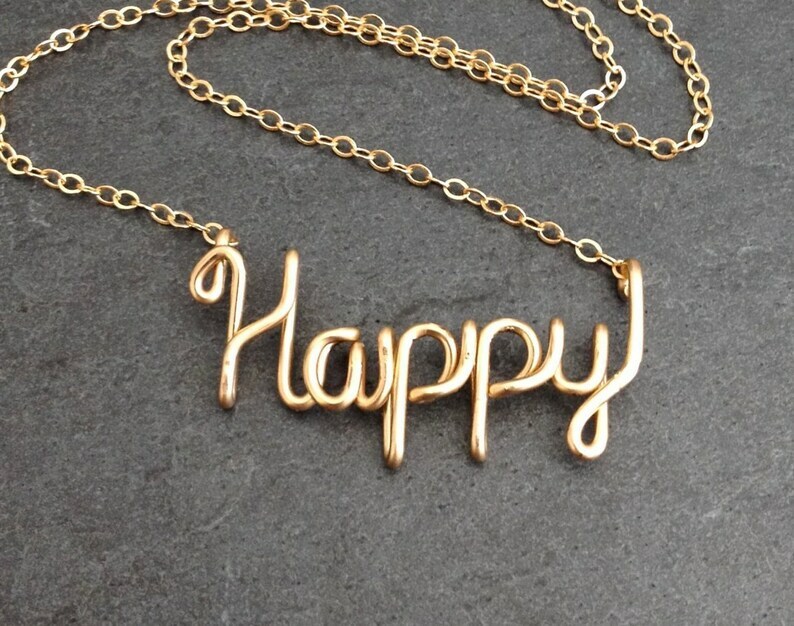 Show the world how Happy you are with this gold happy necklace! Hand twisted from 14k gold filled wire and hung on a delicate feminine 14k gold filled chain, this necklace reads "Happy". The word portion measures about 1 inch wide and the length of the entire necklace you select will include the word happy and the chain. What is 14k gold filled wire? 14 karat gold filled wire is 14 karat gold coated over alloy metal which may contain sterling silver, brass, nickel, steel and other metals. It is not solid gold, therefore much more affordable, but still equally as beautiful and lustrous. It will last several decades or even a lifetime if cared for and stored properly. Your necklace will come with care instructions. The necklace on the model measures 17 inches long and is just an example of necklace length. Breathe Necklace. Yoga Gold Breathe Necklace. 14k gold filled Breathe Necklace. Custom Word Wire Necklace. Yoga Inspired Necklace. Name Heart Necklace. Personalized Custom Script Name Necklace with heart. Gold Heart Name Necklace. Rose Gold Name Necklace with heart. Personalized Rose Gold Name Necklace. Custom Pink Gold Name Necklace with heart charm. Wire Script Name Necklace. Heart Charm Name Necklace. 14k Solid Gold Name Necklace. 14K Real Gold Custom Name Necklace. Personalized Real Gold Wire Script Name Necklace.